The present volume chronologically follows BOSWELL'S LONDON JOURNAL, and in it we find young Boswell devoting his energies to becoming a man of dignity, sobriety and in obeisance to his father and Mr. Johnson. He has come to Utrecht to fill out his legal education in an accepted Scotch procedure. This volume contains only a fragment of the journal -- that written after leaving Utrecht -- since the rest of the work was lost during Boswell's lifetime. If you wanted to be flippant, you could describe this as an early example of the literature of the gap year. A young man with a wealthy upper middle class Edinburgh background comes to the University of Utrecht for a year to study a bit of law, make contact with his Dutch relatives, fall in love a couple of times, and generally amuse himself. 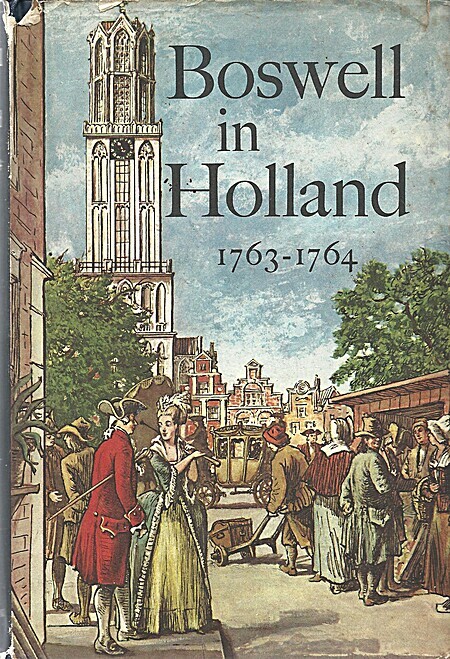 The charms of this book are that the year is 1763-4; the Scotsman is the endlessly self-obsessed James Boswell; and one of the women he falls in love with is Belle de Zuylen. Boswell's journal covering most of this period was unfortunately lost en route from Utrecht to Scotland, but Prof. Pottle managed to reconstruct a kind of narrative from other private papers that survived, including Boswell's "memoranda", his French compositions, and letters to and from various friends, which gives the book a curiously fragmented, post-modern feeling. The memoranda are the oddest and most revealing -- little admonitions he writes to himself every morning, analysing what was good and bad about yesterday, and what is going to be better today. Boswell never quite lives up to his own high standards, in particular because he can't resist talking about himself. "Be retenu" is the constant refrain of the memos. It's a little odd for the modern reader to realise that one of Boswell's objectives in coming to Holland was to improve his French (although, coincidentally, it was also one of my first tasks when I came to live in Holland). Today, you're unlikely to need French unless you want to talk to someone from a Francophone country, but in Boswell's day it was still the international language of polite society. He evidently had to struggle to reach a level at which he could talk to educated Dutch people without making a fool of himself, so he set himself the task of writing two pages of French each day, on whatever subject came into his head. Pottle translated the more interesting of these (he includes one original in an appendix to give us a flavour of Boswell's French), and they tell us quite a bit about Boswell's religious views, his (Tory) politics, etc.